Loretta has been transferred to the organization’s veterinary partner and is now on intravenous fluids for nutrition, infection and pain control. Surgery is scheduled for Tuesday. 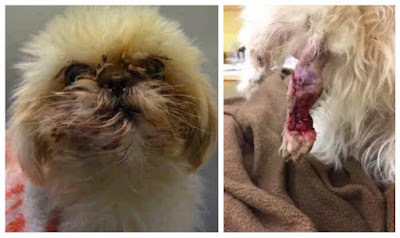 Loretta is a sad reminder to report all suspicions of animal abuse, neglect and cruelty. Someone out there must have seen this little dog suffering. Why didn’t they just make a call to Animal Control? Be the voices for those who cannot speak. Loretta suffered needlessly for a long time before she was lucky enough to have been found and subsequently rescued. To help with this dog’s veterinary care and rehabilitation, please click here, donate@rescuedogsrocknyc.org or RDR NYC PO BOX 101 NY, NY 10028. 0 Response to "Tiny Dog Will Lose Her Leg After Extreme Neglect And Matting"